This week is just full of good news out of the Big Apple. The Legal Genealogist thought it’d be hard to beat that. And then the second announcement came in. The New York Genealogical and Biographical Society (NYG&B) announced that it had concluded its search for a new president to succeed McKelden Smith, who is retiring after serving as president for the past seven years. McKelden Smith was the first president chosen after the brouhaha over the building — and he had his hands full getting the NYG&B back on track. It’s to his enormous credit that the society — the second oldest genealogical society in the United States — recovered and thrived. So choosing a successor wasn’t a simple task at all. The new president needed to be able to continue serving as a public face of the NYG&B to the broader New York community and administering the many tasks of the NYG&B. But the general feeling was that the successor needed one more set of skills: the new president also needed to have strong genealogical credentials. That’s not an easy combination to find. There are loads of thoroughly competent genealogists with strong credentials. There are loads of people with enough public presence to adequately represent and lead (and, let’s face it, fund-raise for) a group like the NYG&B. There are very few potential candidates who can do both. But, yesterday, the NYG&B announced that it had landed one of those very few: as of February 1, the new president of the NYG&B will be D. Joshua Taylor. 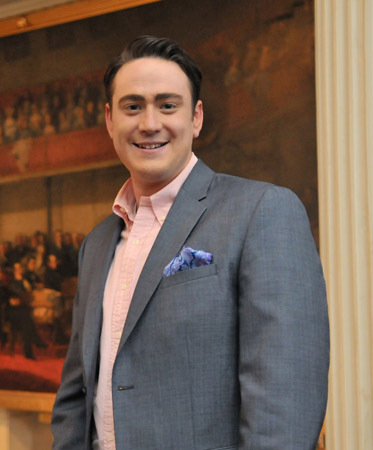 Newcomers to the genealogical community may know Josh mostly as a featured genealogist on the TV series Who Do You Think You Are? and currently as a host on the popular PBS series Genealogy Roadshow, just wrapping up production for its third season. His credentials are a lot broader and deeper than that. He holds a master’s degree in history and a master of library science degree in archival management. He’s the former Director of Education and Programs at the New England Historic Genealogical Society, former Director of Family History at Findmypast.com, and currently serves as President of the Federation of Genealogical Societies. His written work includes numerous articles in American Ancestors, the Association of Professional Genealogists Quarterly, and other periodicals, and he authored The Keane and Sheahan Families of Bridgeport, Connecticut, a study of a family’s immigration and life in New England after the Irish famine. It’s a good match, between a great genealogist and a great genealogical society. You can read more at the NYG&B blog, here. I am so very pleased for my friend, Josh Taylor. He is a bright star in the genealogical community with impeccable genealogical skills and an excellent business understanding. He will take the organization to new heights, I am sure. Congratulations, Josh! A wonderful choice by NYG&B for sure — and a great organization for Josh to use his skills for! Hopefully Josh leads the Society to actually do something. I quit after they transferred the collection to the NYPL. Having direct access to the collection was the only thing of value to me and while it’s good that the NYPL now has it, its value is limited because most of it is offsite and you now need to know exactly what you’re looking for and make plans weeks in advance to use it. A few seminars a year, most of which are put on by other entities and annual tours of the same cemeteries doesn’t quite cut it. Good luck to Josh. As a devoted New Yorker with roots wide and deep, I hope he can restore some of its glory. Publishing a pricey research guide that does little more than compile Google finds in a printed form hardly measures up. Transferring its library to the NYPL was a disaster. While I love NYPL, it is not a cozy retreat for rummaging in the stacks as we used to do. I sometimes spent days doing just that.